Good evening gals & guys! I do realize that everyone has their favorite RC Transmitter Radio that has pulled them through in this hobby. I have had many Transmitters and the best has been JR XP-7202 and the First GEN DX7 in the JR Case. I have always wanted to try out the First GEN DX7-SE (Special Edition) which comes with an enhanced RF board that operates at the faster sampling speeds such as 11ms (11 Milli-Second) sample rate. I had a few disappointments at certain classified boards and finally over at eBay I found someone selling one and I was able to win the bidding session all the way to the last second. There was at least three other people that was head-to-head in trying to get this GEM of a transmitter but, my experience in bidding was no match for these less experienced. Therefore, I am the proud owner of one First GEN DX7-SE and I just tested it and all systems work as they should. Can't wait to fly my experimental model, Parkzone T-28 Trojan (1.1m wing span). A video and pictures of what I did to avoid the Steering ARM Block from moving while the Nose Wheel Retraction is in motion. This mod prevents the Steering attachment BLOCK from sliding along the Steering ARM such that it will NOT twist the Nose Wheel Assembly and hit the Foam end stops of the FUSE. Video contains the pictures as well. Replacing Nose Wheel Retract - E-Flite Carbon-Z T-28 Trojan! If anyone has replaced the Nose Wheel Retract, it may have been someone who modified it with something else because I just could not see any post that had someone replace the STOCK for STOCK nose wheel retract. Let me tell you......................to me it was a BIG pain in the ASHE! Certainly, this doesn't fall in any solid manner of a modification but, it does fall in a slight mod in terms of what you have to do in order to successfully replace a STOCK retract with ALL the disassembly and re-assembly! Okay, I am beat from a couple of hours with playing ROPE-A-DOPE with this Nose Wheel Retracts! It seems like grease may have played a part in the BURNING of the Nose Wheel retract Circuit board "or" someone took-off or landed the model in WET GRASS! You need to look at the pretty pictures I have provided to see what I had to do and some recommendations! E-Flite Carbon T-28 Trojan - Retract current draw measurements! Packed up the Giant E-Flite Carbon T-28 Trojan and had a super Sunday with it along with a Tower Sport 60 (Balsa) RC Model. The E-Flite Carbon T-28 Trojan performed just amazingly. I was able this time to really test the Main Gear Retracts and they work perfect. My younger years..............................39 years ago! Okay, back in Miami, Florida during 1979, I bought (by mistake) a used 1973 super bug (Semi-Automatic). Needless to say this Super Bug was fast as there was no Clutch in the traditional manner. All shifting was done by Vacuum assist with the Shift Stick and Three forward Speeds plus one reverse. I was a struggling Student attending College and had to work UPS facility at Miami near the International Airport (That Facility still exists) and had to work the grave yard shifts. Needless to say I had a couple of Drunks rear-end me and that's where theses Large Vacuum Tanks were located, at the underside of the rear fenders! Without them you could not shift, period. One Drunk Driver rear-ended me and I went after him in 2nd Gear at 50-MPH and he almost eluded me but, I found him by his Brake Lights. I was crossing North West 22nd Avenue Bridge (Over Miami River) and as I saw him with the excitement, I made the mistake of turning too soon to continue and give chase and went off the bottom end of the bridge and the car went AIR borne 5 feet off the ground and landed going 40-MPH, the VW Super Bug continued and I was able to catch the SON of BEECH! He was SOOOO DRUNK that I had to reach in and Turn OFF his car and get the Car Keys from him. We both Struggled in the dead of the night and perhaps woke up the entire block. E-Flite Carbon T-28 Trojan - Retract Punch Through Wing! As reported a few pages back, I have noticed that the Left wing had what appeared to be Hangar Rash but, WAIT a Second...................a closer look yield an UGLY thing known as Retract Almost Punch Through syndrome Certainly, we all know that I am the 3rd owner so, who knows what happened before my ownership. ALL I KNOW "IS" I have been pretty gentle with this model and it lands like a docile Trainer but, yes these Retracts / Struts don't give so, the landings have to be picture perfect. Otherwise, the motor end of the Retract tends to bend into a THIN PIECE of foam and you will see it protrude on the top side of the wing! Okay, finally had some time to do this and the only way was coming home from work and taking a lap for 2 hours and now I am refreshed and doing an ALL NIGHT-ER of sorts and I feel like a Freight Train and going to town with this model. I am pretty happy with my results and the ONLY MOD was to insert a 1/16th Basswood inside where the Left Retract goes and insert this piece at the deep end of the wing where there's sufficient foam (Strength) and using WHITE Glue to keep it stay! Additionally, using two small washers, I was able to lift the Motor End of the Retract some so, it will have a higher sitting and not tend to go directly and punch through so easily. I am hoping that the Basswood would keep it from punching through during a hard landing. Was able to meet up with two of my flying RC buddies over at the East Coast of Central Florida over at a park field North of Titusville, Florida and what a show Mark S. (Marked) gave us all this morning (Saturday, 12-08-2018). 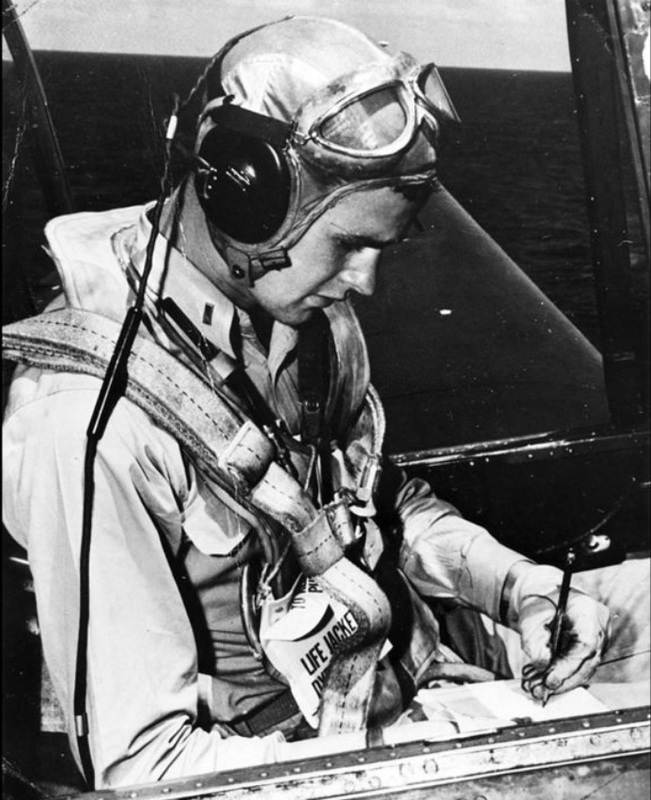 May you rest in peace and thank you for not dying in that Avenger and thanks to your service to the USA! Maiden Flight of my Carbon T-28 Trojan! I finally found my long lost (I thought) video capture showing my maiden flight of my newly acquired E-Flite Carbon T-28 Trojan! It was on my I-Phone 6S Plus all this time and due to some sort of settings setup, I missed it originally! Okay, without any delay, here's the maiden flight and just watch this model float! I have no idea if this model is something new or not but, I recorded it's flight on Saturday (11-24-2018) over at the RC Club field in Titusville, Florida at a club known as Moon Port Modelers RC Club. David Rich is a fellow Instructor who flew this model with precision! The Still Photographs were possible by Gerry (simano) who came with his Digital SLR Camera. Thanks Gerry! People Trolling on your For-Sale Ad! I just don't understand WHY-O-WHY people come to Troll into one's FOR-SALE-Ad to dump crap and try to slander one's attempt to sell a model that one improved and most especially including items that I didn't get when I purchased with it originally. It seems like some here are trying to be some sort of Price Police without any justification of any kind! I have had to DELETE many Troll Like postings not only on this one attempt but, others and it is beyond me WHY-O-WHY we have so many people that don't have anything better to do than TROLL someone's For-Sale Ad? Please note that I purchased this fantastic E-Flite Carbon T-28 Trojan model WITHOUT any Receiver, External BEC, Flight Battery nor any of the Hardware improvements that I have invested my time, effort and monies! Additionally, I purchased this model with a BUSTED Nose Wheel Retract of which I am now including a brand new in the BOX replacement! Hurry - Selling my E-Flite Carbon T-28 Trojan - Central Florida! This will be a great opportunity to own a discontinued E-Flite (Horizon Hobby) Carbon T-28 Trojan! For those that are located near Central Florida because there will be no shipping for this model. Here's the FOR SALE Ad! E-Flite Carbon T-28 Giant 78+ inch wing span! I must be with great luck lately (Blessed) and thereby resulting in looking like an early Christmas! Just look at the deal I secured today for a cool $230 cash! E-Flite Carbon T-28 Giant 12-lbs RC model! Hangar9 Christian Eagle 90-size ! How about a Hangar9 Christian Eagle 90-size! How much? FREE! Just gas to pick it up 128 miles away! The gentleman was going to throw it away in the dumpster! EDIT: Just look at this one going for a cool $700 US! Yes, it will be an Electronic RC flying model after I am done with it! California Wild Fires and People without Insurance! Please consider helping out some of our brothers and sisters in the Hobby that have LOST Everything! A MAIN Hobbies sell all sorts of things for many type of hobbies. Please read up this GO FUND-ME page and consider donating anything you can. After several months, perhaps one solid year, I finally convinced my buddy to let me help him with his 2nd GEN pico Tiger Moth that he bought on-line when these were still available. It is interesting that at times we get distracted or just too busy with Life's other demands and we happen to miss things that make Electric Flight not possible after selecting one's Power System. First off, the Orange Receiver he was using was found to be defective because there was no movement from the servos whatsoever and I made sure that polarity hook-ups of the wires were okay. The motor was being armed but, it was obvious that the motor's "TIMING" was OFF from specifications and ESC re-programming was required. Turn everything OFF and went into programming mode and used the instructions within the Horizon Hobby E-Flite 10-AMP ESC manual and wrote down what I had to do to bring ALL parameters within the required settings so, things work and sure enough the motor started to work perfectly. Items that were brought back to limits were having the correct Voltage Cut-Off for 2S (2-Cell Lithium Polymer) battery use and of course the Motor Timing for higher Pole (Outrunner) type of motor selection. I can't say enough that Brushless ESC's need to be checked and re-checked for Proper Programming when you finalize your Selection of Motor type and use of how many Cells you are going to use with the final power system selection. 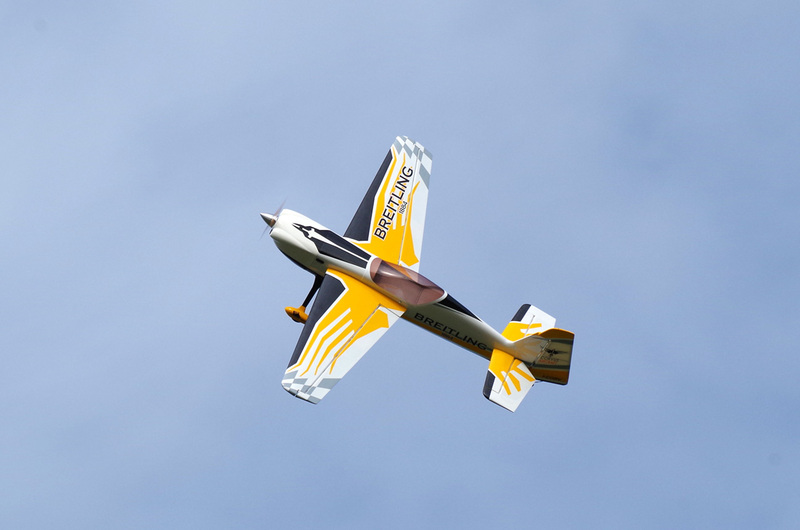 Had the pleasure to Maiden this fine flying model from E-Flite! The model was true and straight on the ROG (Rise-Off-Ground) to my shock and pleasant surprise. Performed at least 4 laps and had the model trimmed and handed the transmitter to Stanley. During Halloween evening here in Central Florida (USA), I was able to acquire (purchase) one very hard to find Slow Flyer model known as the Bücker Bü 133 Jungmeister by ROBBE. It was amazing how things worked out as my "WANT Ad" was not the first. Years ago, I put one out and someone else replied but, that person never completed any transaction. A nice gentleman this time replied and we were able to complete the deal last night so, things has stepped up into very good chances that I will be getting this model after years of being out of production. I am super excited because this model really looks good (Scale) and it's a Slow Flyer model plus it's simple, Rudder, Elevator and Throttle control only. A good friend of mine had it years ago and I was too busy with other models and never got around to ordering one and before I knew it, it was out of Production and Diamond RC, the distributor closed their doors and a few years later ROBBE went out of business as I understand. Therefore, as you may perhaps understand, I am thrilled and super excited to finally acquire such a model that has been out of circulation for so long and not in production anymore. Back in the day, this model flew very well with the Brushed + Gearbox and heavier Ni-MH batteries so, you can imagine with today's modern Brushless motors + advanced Electronic Speed Controllers plus most especially super light and powerful Lithium Polymer batteries it will shine even more for that super "Scale" Slow Flight effect. Of course, when and if I get the guts to fly this wonderful model, it will be with the ultimate perfect weather conditions and the best radio gear. EDIT: The following pictures is from the seller! New Life for JR XP8103 - Using Spektrum DM9 Module! Just a heads up for those that might have a JR XP-8103 laying around without any use and collecting dust like mine were. 1. Purchased some new 3-Cell, 2500mAH, 3C, Lithium Polymers for both. 2. Purchased Spektrum DM9 2.5G (Spectrum) Band module "JR" compatible. 3. Cleaned the radios and adjusted the sticks and that's it! The Spektrum DM9 2.4G Module works like a charm, however, you need to place the radio in PPM mode and lucky me it was already when I powered it UP after 4 years in storage. Now I have the better of both worlds, I can continue flying my older fleet that still has Super Narrow Band 72-Mhz radios and my newer fleet with the DSM-2 and DSM-X receivers. The JR XP-8103 was almost a top-of-the-line radio in it's day so, it's just amazing the quality and wide variation of switches and nubs! Aerospace Engineer, Avionics and Electrical.